Theoretically liquid starts boiling when pressure in some sites of a stream decreases to pressure of its saturated steam. Actually pressure of liquid cavitation creation process depends on the physical condition of liquid. If liquid contains a large amount of the dissolved air, reduction of pressure leads to air allocation from liquid and formation of gas cavities (cavities) in which pressure is higher, than pressure of saturated steam of liquid. The presence in fluid of microscopic bubbles which can be created by a pressure could exceed of saturated steam pressure. Each bubble, being formed of a kernel, grows to the final sizes then blowup. All process tales about several milliseconds. Bubbles can appear one after another so quickly that seem as one cavity. In the absence of kernels liquid can maintain negative pressure or tension about thousand atmospheres without cavitation emergence. By estimates, for water the size of this negative pressure makes from 500 to 10000 atm. In practice water which was subjected to a careful filtration and preliminary processing by pressure up to several hundred atmospheres, was broken off with negative pressure in 300 atm. However in the presence in water of firm, not moistened kernels, happens a rupture of water with negative pressure in some tens atmospheres. It follows to the point that it is quite possible to lift by means of depression water on height. Such phenomenon was already observed during the work with the liquid previously subjected to processing by a pressure. Local pressure is known rather precisely and defines the moment of cavitation emergence very difficult as distribution and the sizes of kernels present at liquid are unknown. Approximately it can be established by a measurement of the total content of gas in liquid, as the value of pressure depends on it. Nevertheless without rather full understanding of a kernels role it is impossible to predict this moment.Bubbles depending on a type of the phenomenon of liquid cavitation can be generated variously. The sizes of bubbles for moving cavities are defined. Pulsations of bubbles volume in a stream of liquid accelerate their collapse. Therefore when imposing pulsations of the stream significantly strengthening cumulative effects, at collapse of bubbles, there is a need of frequencies coordination pulsations of bubbles and a liquid stream. 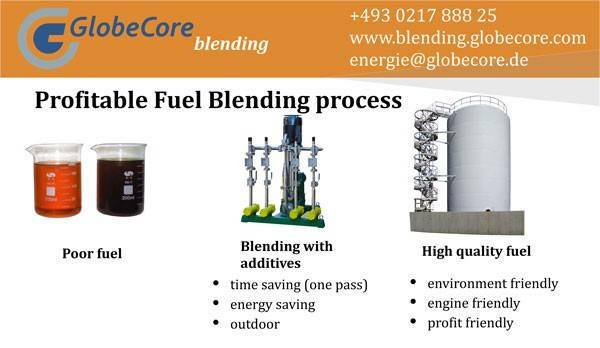 GlobeCore Blending using this process to mixes any types of liquids. With the transition from wide part of an entrance of convergent tube to narrow part, there is the greatest pressure drop in narrow part. For decrease in pressure difference and possible liquid cavitation at mixer walls the configuration of a convergent tube has to look like a smooth curve. The principle work of hydrodynamic mixer based on this technology and used in the USB liquid blending systems. If you want to reduce expenses of you company for fuel production, “USB” cavitation blending system could help you to do that. To receive extra information contact us and technical manager will call you back or download inquiry list and receive free catalog.